The recently announced salary cut throughout the entire production personnel of the industry of from 10 to 25 per cent has resulted in a complicated situation. Some stars and directors have agreed to accept the reduction, a number have flatly refused, and still others are “on the fence,” awaiting the verdict of the majority. At a mass meeting before the Motion Picture Academy of Arts and Sciences on Wednesday night in Hollywood, the favored proposal was that the action be deferred until August 1, to permit of consideration of individual cases, rather than a sweeping reduction taking in all persons, regardless of their value in relation to their salary. 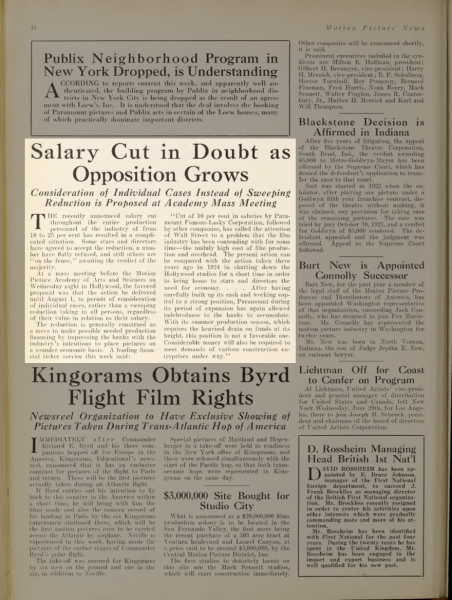 Citation “Salary Cut in Doubt as Opposition Grows,” Motion Picture News, July 8, 1927. All photographs and text excerpts are copyright their respective owners. All original content © 2015–7 Gordon McAlpin.